The Arboretum team recently had to take down a group of 5 Scots Pine trees behind the Schools Education Building in the Garden. The Schools Education Building also known as the Fletcher building was completed in 1968 following on from the completion of the Front Range Glass houses. The building has a number of large glass windows that view out to the garden helping to connect those inside with the outside. The Scots Pines had been planted to create a woodland diorama for the people working in an office on the eastern side of the building. 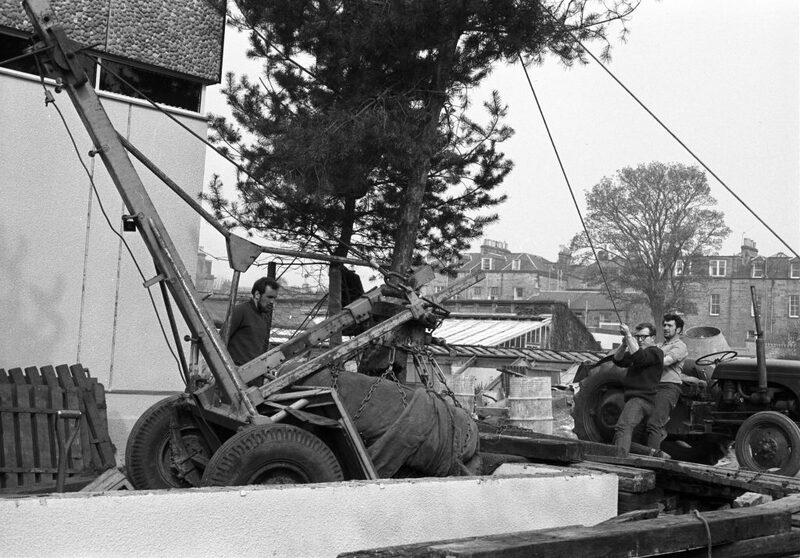 The trees were transplanted from elsewhere in the garden using a Newman tree planter in 1968. A photograph from the archives showcases the skill and care of the garden workers. The trees established well and grew to a good size but unfortunately two of the trees found a poorly constructed service duct and the roots wrapped themselves around the water pipe that supplies the Research glass houses. Earlier this year the pipe burst and the roots had to be cut away to make repairs. Due to the damage caused to the roots by the repair of the pipe and further damage the roots were causing the trees were removed. The trees weren’t entered in to the Garden plant record system at the time of planting being seen as a functional landscape planting rather than part of the collection. 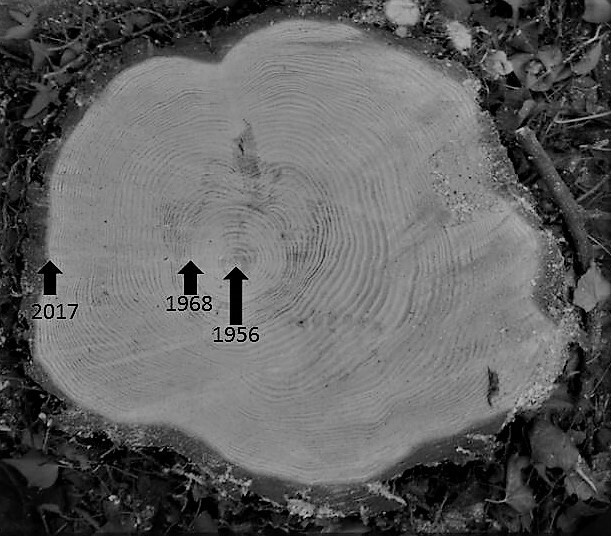 The removal gives us the opportunity to look at the tree rings. We can see that the tree began its life in 1956 and was transplanted in 1968. Examination of the rings shows a change in growth following transplanting in 1968 as it settled in to its new growing conditions. We can also see wider rings on one side of the tree. Coniferous trees often put on larger rings of supporting wood in reaction to the lean of the tree. Student Gardeners left to right, Nick Greensill, Ian Gordon and Ian Waddell.